If you haven't yet, you are about to discover for yourself why so many families have trusted nothing but Watkins food products for their cooking and baking needs for over 140 years. Watkins has something for every taste, cooking and life style. Discerning gourmet cooks who want to use only the best quality ingregients love our gourmet foods and know their meals will always taste great with Watkins. Busy and inexperienced cooks love how our quick and easy to prepare mixes and seasoning blends simplify their life. Cooks who are concerned about living healthier love our natural and organic foods too. You can shop for your Watkins gourmet foods here. or request your free Watkins full product catalog. Watkins dill, it's uses for cooking and as a remedy. Watkins garlic products, their uses and the health benefits of garlic. Watkins ginger and the health benefits of using it in your cooking as well as a supplement. Watkins sage, it's uses in cooking and it's health benefits. Watkins hot peppers, spices, seasonings and hot sauces their uses and the health benefits. Watkins seasoning blends are a busy cook's dream come true. Our expertly blended spices will turn anyone, no matter what your cooking skills are, into a gourmet chef by simply following the recipe on the bottle! One of my customer's favorites is Watkins potato salad seasoning. Once you've tried it, you will never make potato salad again without it. If you are looking for organic foods you'll want to cook and bake with Watkins organic herbs and spices, and the best tasting organic madagascar vanilla. Besides spices we offer you a wide variety of ingredients for you pantry to save you time and money, enjoy the conventience of cooking with Watkins soup and gravy mixes. Bake up a new flavor sensation with Watkins extracts and flavorings, they are great for adding flavor to beverages and savory dishes too. 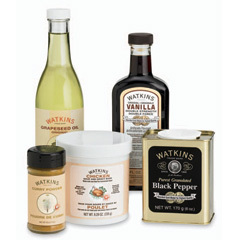 Discover Watkins products like our grapeseed oils and our low/no sodium foods which contribute to a healthier heart. Watkins fruit and vegetable wash quickly and easily removes dirt and other impurities from your fresh produce without a soapy residue or after taste. Watkins food are gourmet quality but using them will actually save you money! When you use a cheaper, low quality brand you need to use more to get the flavor you want. You can use less of Watkins spices, seasonings, flavors etc and get more flavor which gives you better value for your money. When you buy Watkins food, it comes fresh from our factory right to you door. This means it hasn't been sitting in a warehouse or store so there is no loss of quality. I think you'll find our prices are fair too! Shop and fill your pantry with the goodness of Watkins gourmet foods or feel free to request your free Watkins full product catalog while you are there. To save more money subscribe below for a once a month email regarding our specials and sale prices. Don't forget to save this page in your favorites or bookmarks so you can find us again. Watkins products are featured in these and other popular gourmet food magazines!